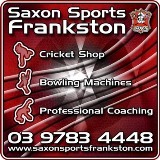 Want to sponsor the Mt Eliza Cricket Club? Contact us at mecc@optusnet.com.au and we will send out our packages to you, we can also taylor a package to suit your needs. Why not join our list of loyal sponsors?